2015 Lineup and Schedule Available Now! We are very proud today to announce the full lineup for the 2015 Steel City Jazz Festival, including some of the most exciting and talented musicians from the Hamilton area and beyond! This year’s festival will feature a broad range of amazing performers including Artist-in-Residence Adrean Farrugia, Terry Clarke, Sophia Perlman, Luanda Jones, The Tom Altobelli Group, the Jazz Connection Big Band, Koopa Troop and more! Head over to the Artists section of our website to check out recordings and videos from this year’s performers, then visit the Schedule page to find out when and where they will be playing. 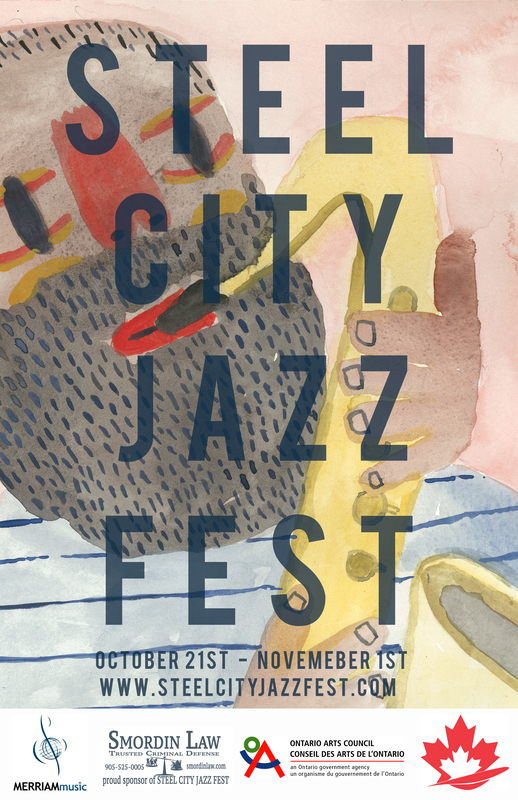 Finally, take a look at our Tickets page to learn all about how to get your 2015 Steel City Jazz Festival Pass! The poster for this year’s festival was designed by Gord Bond, a fantastic artist from born and raised in Hamilton. Visit his website to view more of his work! This year’s festival is our best yet, and it would not have been possible without the support of our sponsors. So a huge thank you to Smordin Law, the Ontario Arts Council, NLP Canada Training and Merriam Music for making all of this possible and supporting jazz in Hamilton! Steel City Jazz Festival 2015 Lineup and Schedule Available Now!